The elusiveness of Joni Mitchell. Mitchell had been invited to perform at the festival, but her agent, David Geffen, took one look at a news report of wet sludge and wild rumpus and decided that Mitchell should stay in the city so as not to miss her television debut. Meanwhile, the members of Crosby, Stills, Nash & Young chartered a helicopter, played at Woodstock, and returned in time to make the Cavett show and regale the audience with dispatches from the revels. As David Yaffe writes in Reckless Daughter, a new biography of Mitchell, "Joni managed to play four songs and chime in when she could about the virtues of Pierre Trudeau or share her views on astrology (she noted that Crosby, a Leo, looked like a lion), but mostly she had to sit back and hear war stories about the event she'd missed." And yet, despite having heard only secondhand tales about Woodstock, or perhaps because she experienced it that way, Mitchell would go on to write the most emblematic song about the festival, sitting alone in her hotel room watching the young people roll around in the grass on TV. Mitchell started performing "Woodstock" shortly after her Cavett appearance; her song was a lament, grieving for a halcyon time that was already beginning to slip away. The song became a huge hit the following year, when Crosby, Stills, Nash & Young recorded their own anthemic version, but it was never meant as a celebratory ode. When Mitchell sings about being "stardust" and needing to "get ourselves back to the garden," there's a patina of cynicism to the whole affair; she can't get back to the garden because she was never there. She knew that the experience could be lost, because she'd already had to sit it out and felt the lacuna. As Yaffe writes of the song, "It is purgation. It is an omen that something very, very bad will happen when the mud dries and the hippies go home. That garden they had to get back to - it was an illusion. It must have been lonely for Joni. She was the only one who could see it." Being the person perched outside the window can be the loneliest place in the world. And yet it is here that Mitchell, now 73, has seemed most comfortable throughout her long career; she is at peace when floating through the membranes. Her voice used to do it, at least before the cigarettes blackened her lungs. Always bobbing above, Mitchell has posited herself, as she did in "Woodstock," as the woman lingering at the edge of the action. "I'm just living on nerves and feelings," she sang on "People's Parties," from 1974's Court and Spark, "With a weak and a lazy mind / And coming to people's parties / Fumbling deaf, dumb, and blind." Of course, in order to really float above it all, you cannot be pinned down, and people (fans, critics, biographers) have been trying to pin Mitchell down since she was a young art-school dropout from Saskatoon singing in Detroit clubs. They have been trying to stick her emotions to their own ribs like a lepidopterist pinning butterflies to a board, claiming her own words as theirs and then becoming alienated after Mitchell dived so deep into her experimental jazz and polyrhythms that they couldn't easily suction themselves to her poetic vision. In a 1979 interview with Cameron Crowe in Rolling Stone - the first she'd granted to the magazine after it had snarkily labeled her the "Queen of El Lay" in 1971, with a map of her romantic liaisons - Mitchell said: "If I experience any frustration, it's the frustration of being misunderstood. But that's what stardom is - a glamorous misunderstanding." Yaffe had intermittent access to Mitchell and her milieu throughout the writing of his book, and he has given us the best chronicle to date of Mitchell's creative process and the specific way her songs were composed. He is especially good on her unique tuning methodology and her myriad influences, from classical composers to the swingy American Songbook. He breaks down her songs in encyclopedic detail, from inspiration to cultural reception to the intimate moments of their composition. But one has to wonder how much of Reckless Daughter would feel like yet another glamorous misunderstanding to the artist. Mitchell has said in many interviews that she longs for the kind of creative carte blanche that she sees afforded to her artistic equals (Bob Dylan, Leonard Cohen, Picasso - it is worth noting that Mitchell almost always lists men as her artistic equals), and Yaffe's deep study does contain a new level of granular, obsessive analysis that treats her songwriting as great art. Yet many of the passages in Yaffe's book read like a swoony valentine to Mitchell, or at least to the effect that her music can have on the spirit. Like so many who have fallen under her music's spell, Yaffe has idolized Mitchell since he was a teenager - a time when her voice sounds particularly potent, lasering through permeable emotional states - and his eternal fondness underscores the narrative. Mitchell once compared herself to "a cellophane wrapper on a pack of cigarettes," a quote she likely regretted the moment it appeared in print. Too many people have tried to see through her, not realizing - as Mitchell would herself discover - that the best way to understand something is often to view it obliquely. The best poems and songs about Woodstock weren't, after all, written by those who were there. Yaffe, a professor of humanities at Syracuse University, begins his book by detailing every entertainment journalist's dream, which turned quickly into a nightmare: In 2007, The New York Times sent him to Los Angeles to interview Mitchell, and he gained an enviable degree of access to the singer. They ate Italian food at a Brentwood restaurant that allowed Mitchell to chain-smoke on the premises; they drank Château Margaux back in her den; she delivered "Dorothy Parker - like zingers" about ballet and the environmental apocalypse and Dylan and Debussy (which, according to Yaffe, "she pronounced 'De-Boosie'"). Then his piece came out, and she hated it. "I got bitched out by Joni Mitchell!" Yaffe writes. She called, furious at his use of the term "middle class" to describe her home. "I don't know what you think of as middle-class," she scowled. "But I live in a mansion, my property has many rooms, I have Renaissance antiques." He quickly told her that he should have used the word "earthy" instead, adding, "If I could substitute the word now I would." But it was too late. "She was so disappointed in me," Yaffe writes. "She had thought I was different, somehow better than the others. Now I was the worst." Much later, in 2014, a friend urged Mitchell to speak with Yaffe again, and she relented, allowing him to capture several hours of musings on tape. It was a few months before she suffered a brain aneurysm, which, along with debilitating Morgellons disease, has kept Mitchell largely out of the public eye ever since. Despite the dressing-down, Yaffe seems to have remained starstruck. "You can always flip the record, put in another CD, reset the iPod. Close your eyes. Joni Mitchell will be there waiting for you," he writes. For Yaffe, Mitchell has never lost her glamour, even when she was openly resistant to being comprehended. This leads him to read her work, often line by line, with great tenderness, but it is also clear that he is writing under the influence of dazzle, and he is particularly defensive of Mitchell's later jazz work (which stymied critics at the time of its release) and of her push-pull with the media, the record business, and in later years her daughter, whom Mitchell gave up for adoption in 1965, when she was still living in Canada, and reunited with only in 1997. In a 1982 interview with New Musical Express, Mitchell said there was always something empty to her about this kind of broad paean. "If your self-esteem is at a low ebb and you're being showered with affection, it seems out of whack. It's like someone you feel nothing for telling you they love you.... I just couldn't get used to people sucking in their breath when I walked by. But I insist on my right to move about the world, and I go a lot of places by myself - as a writer you have to." Mitchell would never have written "Woodstock" had she gone to the festival; nor would she have composed "Little Green" if she hadn't given up her child, or many of the mournful tunes on Blue if she hadn't loved and lost, clung to and escaped from. She had to move through the world to write about it. Growing up in Alberta, where she was born Roberta Joan Anderson in 1943, Mitchell suffered from polio and so began singing and painting in her solitude. Her work forever after was sealed to her lonesomeness, but not, she insists, as so many have written, to an innate softness. It was strength that pulled her through the illness, and it was this strength that she retained. If anything, her gradual hardening over the years is a result of so many praising her for being pliable - she may have run headlong into jazz because after Blue, she said, "people started calling me confessional, and then it was like a blood sport. I felt like people were coming to watch me fall off a tightrope or something." Yaffe notes an encounter that Mitchell had with Kris Kristofferson in which he advised her to "save something for yourself"; she was giving too much away. "The vulnerability freaked them out," Mitchell said of those around her. There is a part of Yaffe's narrative that still feels freaked out, or at least deeply invested in Mitchell's most cellophane period. He rhapsodizes about Blue, still her most lauded album, with a delicate sweetness: "It's the feeling underneath the tears, before the tears, the surge and the power of heartbreak that Joni has captured so masterfully in her work. 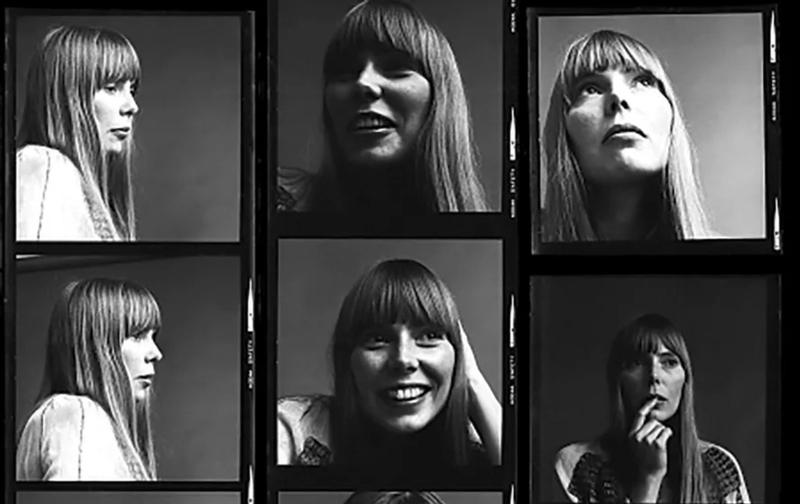 This is the Joni Mitchell that her listeners would want, frozen in vocal leaps, emotional depths, passionate, sultry, full of memories, but in absolute possession of them. This is a beautiful woman who is sensitive, sensuous, and fully attuned to experience, yet somehow beyond heartbreak." And indeed, this Mitchell - the pretty California blonde with the tuning-fork mind and the plaintive voice of an ancient siren - is, it seems, the Mitchell that her listeners (and her biographers) will always affix themselves to, despite her endless attempts to evolve. This was also the Mitchell that '90s babies like me grew up on as the result of a Lilith Fair - ish revival of her stripped-down earlier work. We drove down highways listening to "Cactus Tree," a song about never quite settling down, and felt that it mirrored, in some deep and cosmic way, the alienation we were experiencing as we started to plug into our new, more adult lives - but also to detach from one another. No aspect of Mitchell's work has been more glorified than the poetry of her aloofness, her ease with picking up and lighting out on her own. Reckless Daughter tries to travel with her. It is a balanced contextualization of Mitchell's life from both sides. It chronicles her ill-fated first marriage, to Chuck Mitchell, a man who never really understood her voice and was resentful of her ability to use it, and it doesn't shy away from the complex struggles that Mitchell went through when reuniting later in life with her adult daughter, Kilauren. Yaffe also doesn't tiptoe around Mitchell's complicated (and sometimes downright offensive) attitude toward race - such as her decision to appear on the cover of Don Juan's Reckless Daughter in blackface, or her statement that she'd like to open her memoirs with the line "I was the only black man at the party." But overall, Yaffe's narrative still tilts toward a depiction of Mitchell as the romantic heroine, excluded from the gang but able to capture its spirit better than anyone. Mitchell has said, many times and in many interviews, that she cannot stand any art that doesn't shock her with newness, that the quality she most admires in anyone is invention. "I'm born in the Day of the Discoverer in the Week of Depth," she once told a reporter, referring to her star chart. "I really love innovators. I love the first guy to put the flag at the North Pole; the guy who went there second doesn't interest me a lot of times." Many people went to Woodstock; Mitchell was the first to mine it for material. Perhaps because she always remained on the margins, it was her absence from the festival that made the song so perceptive. And it's certainly what makes writing about her songs with any sense of distance so difficult. Her words are so intuitive, her translations of emotion into song so instinctive, that it's easy to want to read her life with an equal desire to untangle her technique and remain mystified by it. Mitchell is brilliant and yet opaque. She is an explorer of new frontiers, and yet her admirers have, since her first records, longed to hold her back, to protect the Mitchell they thought they knew. But Mitchell's voice keeps changing, and so does her legacy. Yaffe's biography - chronological and lashed to the songs as it is - doesn't feel like it reaches as far into the horizon as her songwriting. Mitchell has said, more than once, that she intends one day to write her own memoirs. So perhaps, as she has always done, she will have to make the maiden voyage herself. This article has been viewed 1,360 times since being added on October 26, 2017.